We would be delighted to talk with you about any DBS V8 engine requirements you may have. As with the DB5 / DB6 we can meet all our clients’ objectives. Our approach ensures any work carried out is done to the highest possible standard, at an affordable cost. The DBS V8 was announced in 1969, and despite a loud clamour from customers and dealers, Aston Martin did not iron out the gremlins in the car until later in 1970. The DBS was always designed from the outset to accept the V8 engine. Externally the only difference between the 6 cylinder 4 litre DBS and the DBS V8 was the V8 use of forged alloy wheels, that given the torque generated by the V8, would have stressed the splines and hubs of a wire wheel beyond safety limits. 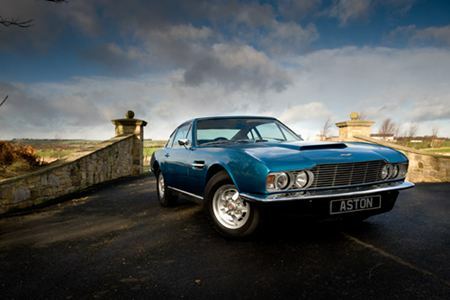 Internally, the DBS and DBS V8 were to all intents and purposes indistinguishable. By 1967, it had been decided, in the light of US emission regulations that the best chance of being able to comply with the Federal regulations, without serious power loss, would come from using fuel injection. To that end, Aston Martin worked closely with Bosch, to develop a mechanical fuel injection system. Development started in 1967 and by 1969, the first production engines, now at 5.3 litre capacity, were ready, these now developing about 360 bhp. This was the engine used in the DBS V8. The performance for its day was unrivalled by any other production car, with a consistent top speed of 162mph plus, and with a 0 to 100mph time of 13.5 seconds or less. The Bosch Fuel injection system was not however, an unmitigated success, and like the Fuel Injection that was offered on the DB6, suffered all too frequent loss of tune from the effects of a drift in the operation of the injection metering unit.. The system was always tricky to set up correctly and few dealer technicians showed any real competence at so doing. However, the result of a well adjusted Fuel Injection system was dramatic, creating a car whose performance was rivalled only by the V8 Vantage some 9 years after the DBS V8 was launched.. Customer deliveries really only started in earnest for the 1971 model year, to glowing road test reports, but a growing clamour from customers, who almost from the day they took delivery, started experiencing problems that were to bedevil the car and which within 18 months, would result in the announcement of the Aston Martin V8. Upgrading the "standard" V8 Vantage engine to 6.0 litres is a large undertaking but highly advantageous.